The sweeping focus on exceptional design only happened when personal devices became, well… personal. Essentially these devices have become an extension of our bodies. More importantly, they’ve become an integral part of how we relate to and communicate with other people. Those functions make them part of the modern human experience. As technology advances, the integration between us and our devices will become ever more tightly linked and personal in ways most of us haven’t even conceived of yet. And therefore, customers’ expectations will dramatically raise demand for great design across all disciplines. The companies who do it well will flourish. Those who only do it ‘well enough’ will discover that good enough simply doesn’t cut it in the experience-driven economy. Great design removes the barriers as we touch, stroke, and talk to our devices. Actually, great design removes barriers in all aspects of life. Merely adequate design produces an average experience at best. Poor design just frustrates the heck out of everyone. Why, then, is it so rare for products and services to reach a high standard of an exceptional user experience? We forget to include the people. Oh sure, companies are getting better at bringing customers into the equation. Steve Blank has a customer development model, manifesto, and compelling evidence that ties understanding customers with strategy and business model. (I recommend taking a look. Blank knows what he’s talking about.) There’s still a missing link, though. The people who make or deliver the product/service. Companies like Amazon, Zappos, and Zingerman‘s have demonstrated for years that careful attention to product, service, and process design reaps big rewards in the marketplace. Regardless of their strategies, each of these organizations combined functionality and ease of use in a way that connected with customers. More importantly, these companies provide examples of what happens when you pay careful attention to designing the employee experience. Just as people appreciate great UX design for their iPhone or Android apps, a carefully designed employee user experience (EUX™) gets rid of barriers that keep people from easily achieving their purpose at work. The design process begins when a company’s leaders dig deep to define and communicate the elements that make a company self aware. The second phase of the process: Getting the right people on the bus and in the right seats. The list of attributes is too long to note in a single post, but you get the idea. 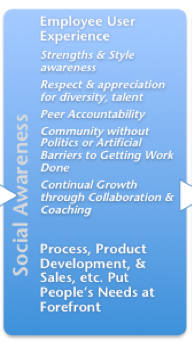 Combined, these elements set the stage for the third element of corporate emotional intelligence: Social Awareness. Taking a page from strengths-based leadership, people who understand their strengths, weaknesses, and fit within the company as a whole can form into self-managing, cross-functional teams. A corporate structure that delegates decision-making to the employees who perform the work provides the autonomy people seek. The employees who do the work also design processes that will create frictionless workflow. With respect to motivation, coaching and collaboration from both formal and informal sources enhance employees’ abilities and create opportunity for growth and mastery—two of three motivational elements that create engagement and wellbeing in the workplace. The third element, purpose, has already been embedded in the company’s DNA as Self-awareness. The model puts people’s needs at the forefront of process development, and a socially aware company looks outside its walls. Because the accumulation of power has little meaning to the people in this type of organization, functions can exist without siloed operations. With the appropriate infrastructure, an exceptional employee experience designed in this manner leads to an exceptional customer experience. Dare I say it? The intended customer experience becomes the brand. Information flows from sales and marketing into the company to infuse customer needs related to the company’s purpose into product, service, and process development. For many, this type of company sounds like a fairy tale. I’ve worked with a number of teams that prove this approach can, and does, work. Tired of the pain and frustration of working with teams don’t click and processes get in the way of getting “the important stuff” done? Let’s chat. Marcia – You are right on! Nice piece and a great summary of your model. Designing the best EUX should lead to the best UX since employees will be motivated to do great work and serve customers!